Gavin Hunt is making his Isle of Man TT debut this year. Gavin is riding for his own team JAR Kawasaki and will be competing in the superbike, superstock and senior TT races. Son of former TT rider Paul Hunt, Gavin is a rider with a good racing pedigree that includes top 20 finishes at the North west 200. Alongside this Gavin has been a regular competitor in the national superstock championship. 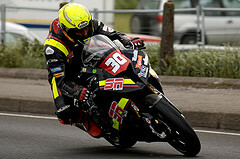 Given Gavin’s road racing experience at the North west 200 it will stand him in good stead for his TT debut this year. In all Gavin Hunt’s Isle of Man TT debut this year will be one watched by many.